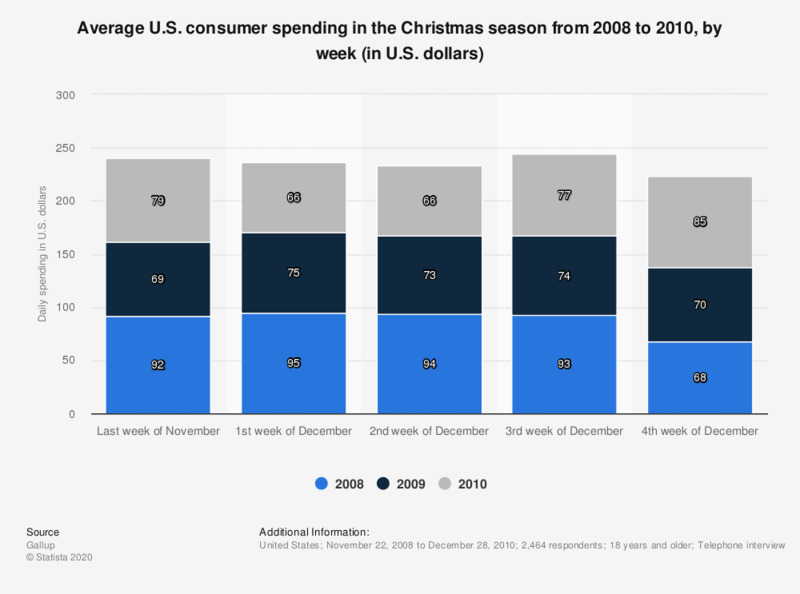 The statistic depicts the results of a survey about the average U.S. consumer spending during Christmas season, i.e. in the last 5 weeks of the year from 2008 to 2010, by week. Even though the trend seems to indicate that people spent the most of their money in the first three weeks of December, in 2010 data differs slightly: spending has increased even more over the weeks with Christmas approaching more and more and consumers getting more eager - and maybe a little desperate - to find presents for their loved ones. While the respondents reported to have spent an average of 79 U.S. dollars in the last week of November 2010, they spent an average of 85 U.S. dollars in the 4th week of December in 2010. Results are based on telephone interviews conducted as part of the Gallup Daily tracking survey during the week ending Dec. 26, 2010, with a random sample of 2,464 adults, with weekly random samples of about 3,000 adults for each of the first three weeks of December, aged 18 and older, living in all 50 U.S. states and the District of Columbia, selected using random-digit-dial sampling. 2010 data based on weeks ending Nov 28, Dec 5, Dec 12, Dec 19 and Dec 26. 2009 data based on weeks ending Nov 29, Dec 6, Dec 13, Dec 20 and Dec 27. 2008 data based on weeks ending Nov 30, Dec 7, Dec 14, Dec 21 and Dec 28. How much do you expect to spend shopping for gifts this Christmas compared to last?